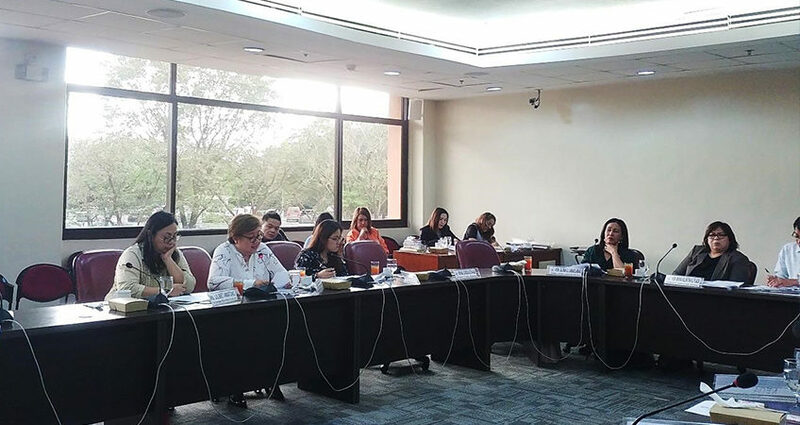 PUBLiCUS pushes for crowdsourcing law - PUBLiCUS Asia, Inc.
PUBLiCUS Asia’s Founder/CEO Maria Lourdes Tiquia, as a resource person, appeared before the House Committee on People’s Participation hearing last January 30 to support House Bills Nos. 8405 and 8773, authored by Rep. Gary Alejano and Rep. Lray Villafuerte respectively. The measures seek to promote crowdsourcing or the use of social media and internet platforms to allow Filipinos from all walks of life to participate in the legislative process without having to go physically to the Senate or House. 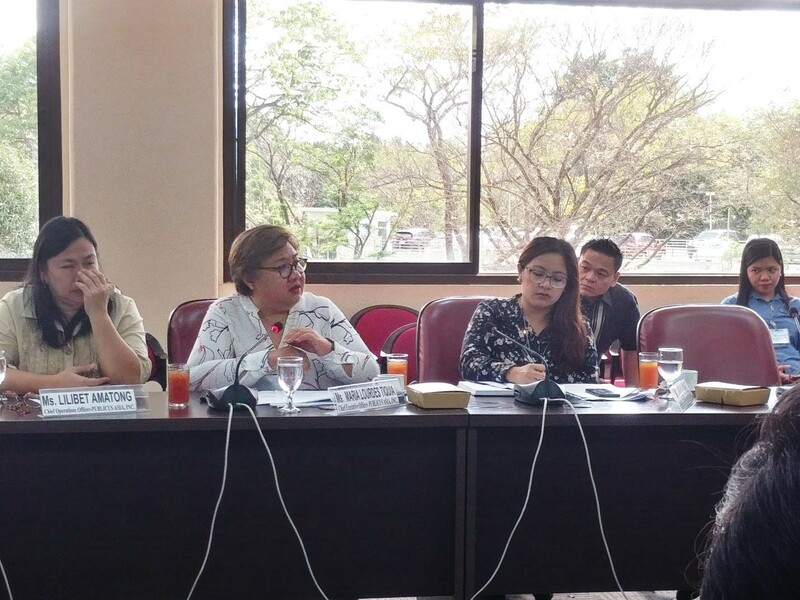 Committee Chairperson Rep. Maria Valentina G. Plaza (1st Dist, Agusan del Sur) led the discussion and Rep. Glona Labadlabad (2nd Dist, Zamboanga del Norte) introduced both measures in lieu of the authors. The other resource person invited were Presidential Legislative Liaison Office (PLLO) Secretary Adelino Sitoy and Undersecretary Ryan Estevez, Department of Interior and Local Government (DILG) Director Romeo Benitez, Department of Information and Communications Technology Legal Officer Chad Moscoso, and National Economic and Development Authority Director Thelma Manuel. Tiquia presented PUBLiCUS position on the matter, showing support for the initiative. “As an avid practitioner of crowdsourcing for legislation and rule-making, we are thankful that there is now recognition of crowdsourcing as a veritable source of information, consultation, and participation,” Tiquia said. Aside from Tiquia, representatives from International Center for Innovation, Transformation and Excellence in Governance, Caucus of Development NGO Networks (CODE-NGO), Affiliated Network for Social Accountability in East Asia and the Pacific (ANSA-EAP), Transparency and Accountability Network (TAN), and Philippine Primark Properties, Inc. (PPPI) also gave their views as private sector representatives. “Right now, the chambers are physically and digitally apart. Plenary debates are already online. We hope the leaders of both chambers can at least get the two chambers together, even if it is only online,“ Tiquia recommended. She suggested PLLO can develop a portal where crowdsourcing by department can be hosted, in response to Moscoso’s question on differentiating the treatment for online consultations and crowdsourcing. Tiquia, like ANSA-EAP Executive Director Redempto Parafina, recommends the review of the prescribed 300,000 verified signatures for the PLLO to forward proposed measure to Congress, as stipulated in Sec. 3 of Villafuerte’s crowdsourcing bill. “One district has an average of only 250,000 voters,” she explained. Parafina also pointed out that a crowdsourcing initiative in South Korea only requires 1,000 “likes” for a measure to be considered for deliberation. PLLO’s Sitoy suggested limiting the verified signatures to registered voters but Tiquia and Parafina think otherwise. “Don’t limit it to voters, harness verification features of Facebook,” Tiquia said. Parafina emphasized an inclusive crowdsourcing initiative, especially because there are social media users below 18 years old. “Inclusivity must be ensured. It should be accessible in far-flung areas and don’t limit it to 18 years and above. Children below that age bracket should also be included, since they are allowed to use those social media platforms,” Parafina stated. Sitoy also suggested extending the pre-approval crowdsourcing consultation from the 5 days stipulated in the Alejano version to 30 days. However, this was met with a little apprehension due to the constitutional provision upon submission of a bill to the president for his signature. NEDA ‘s Director Manuel pushed for a mechanism that will shut down trolls in the future legislative crowdsourcing platforms. Moreover, she urged Congress to institute a robust monitoring and feedback system to ensure that the comments and views of people are acted upon accordingly. She also suggested having the agenda of Congress published one week before the meeting instead of the one day time frame, as stipulated in Sec. 7 of the Alejano Crowdsourcing bill, to allow people to formulate sound comments and suggestions. Tiquia further recommended a sunset provision be included so that there is mandatory review of the law and amendments can be made based on implementation. A technical working group meeting will be called to formulate a substitute bill and get the measure reported out of committee before the congressional break.